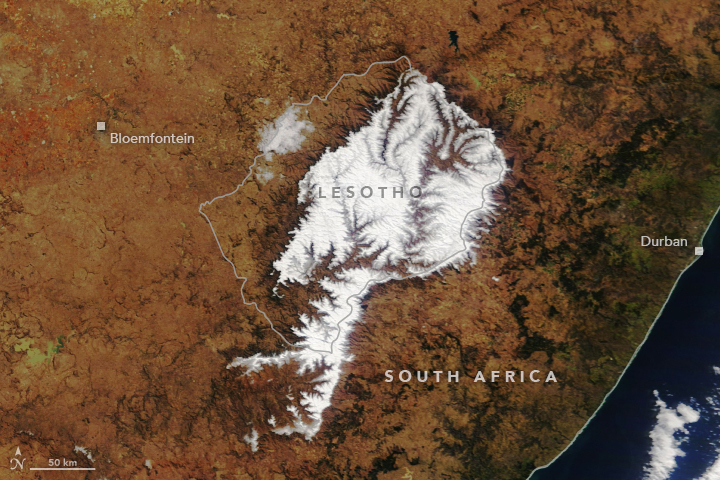 The southern African kingdom of Lesotho has just one ski resort, and for most of the winter, the operators have to make artificial snow. But every so often, nature provides, as it did in early August 2018. The Moderate Resolution Imaging Spectroradiometer (MODIS) on NASA’s Terra satellite acquired these natural-color images on August 6 and 11, 2018. 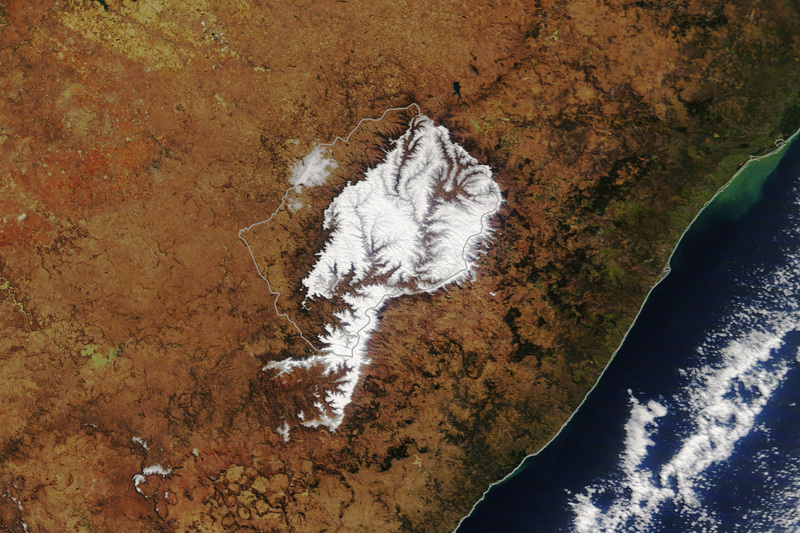 A winter weather front dropped between 5 to 30 centimeters (2 to 12 inches) of snow on most of Lesotho on August 9 and 10, particularly in the Maluti Mountains. 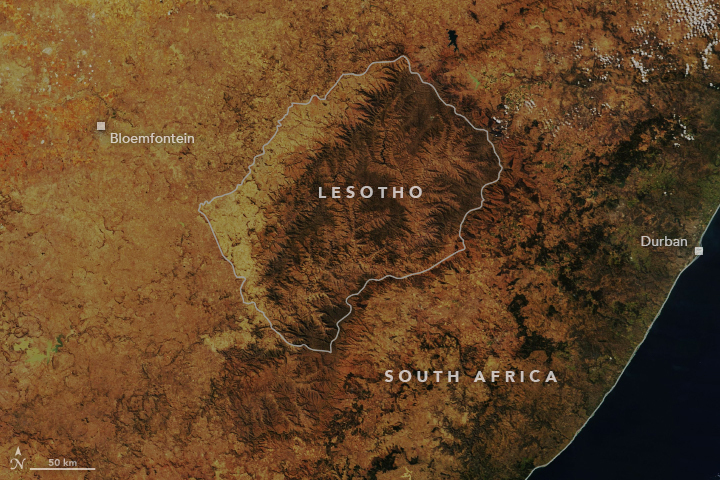 Lesotho is one of the few countries in the world that sits entirely about 1000 meters (3300 feet) above sea level. Snowfall occurs periodically in the short winter season, though not as often as it once did. Heavy snowfalls (like the one in 2016) have become rare, though light dustings occur periodically through the winter. In most cases, the snow melts away within a few days. 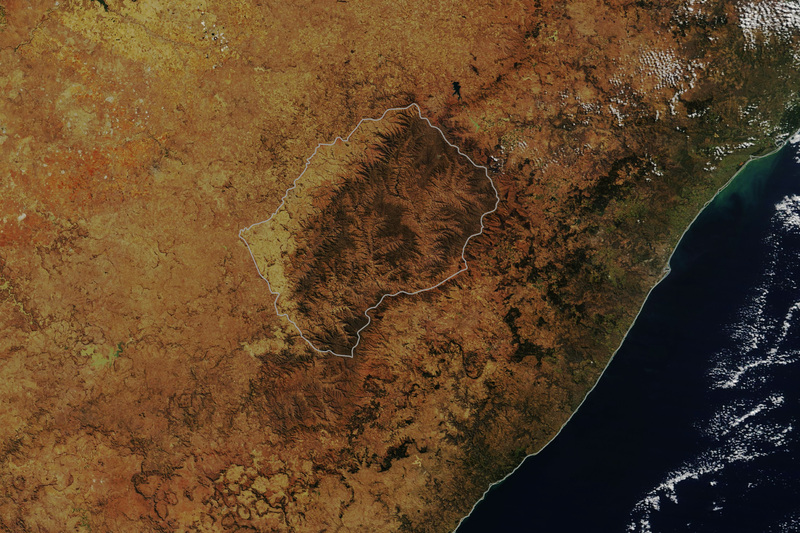 By August 16, 2018, images from the MODIS instrument on NASA’s Aqua satellite revealed that most of the snow blanket was gone. However, some snow is in the forecast for the coming weekend. Click here to see a photo essay of the usual view of the landscape. The Atlantic (2018, July 11) Afriski: Lesotho’s Only Ski Resort. Accessed August 16, 2018.
Business Insider South Africa (2018, August 10) These are the best snow snow scenes in South Africa right now—but you only have three days to go find them. Accessed August 16, 2018. Eyewitness News–South Africa (2018, August 10) Snow Turns Lesotho Into Winter Wonderland. Accessed August 16, 2018.